Wilsons:FC returned to take part in their second Play2Remember Tournament, keen to improve upon last year’s penalty shootout exit at the Semi Final stage to Team Rwanda. 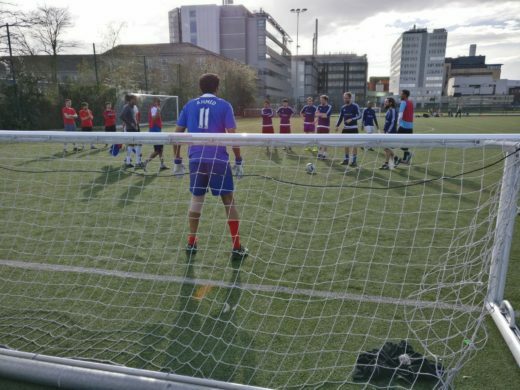 The squad took to White City Tiger Turf in a cautiously optimistic mood. Time would tell if they could go one step further and potentially lift the trophy, which last year was a cake. Present at the tournament was Eric Murangwa, the former Tutsi goalkeeper of the Rwandan national side whose life was saved by Hutu teammates, board members and fans of his club Rayon Sports, when they provided him with sanctuary during the genocide. 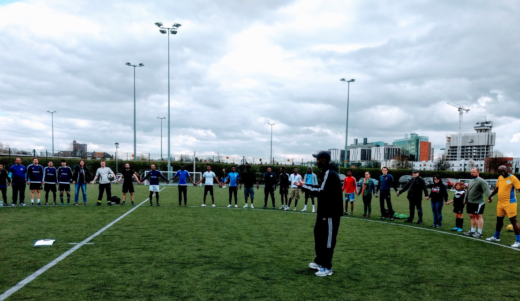 The tournament’s goal is to encourage affected communities to integrate and to become active citizens fighting prejudice, intolerance and hatred, using sports, and football in particular, as a tool. The tournament is organised by the charity Waging Peace and ties in with the UN’s anointed International Day of Sport for Development and Peace, which takes place every year on 6th April. 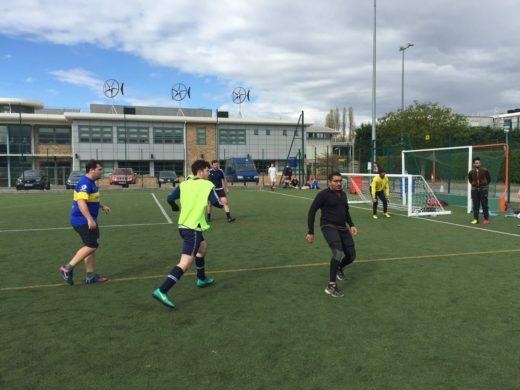 Following the draw broadcast live on Waging Peace’s Facebook page, the Wilsons lads were pitted against fierce rivals Duncan Lewis, last year’s finalists Squad Goals and New London Lionesses FC. Murangwa declared the tournament open with a hand holding ceremony between all participants in the middle of the pitch. Bolstered by the acquisitions of John Sandiford, Kabir Joshi and Georgios Tsigkas, Wilsons:FC attempted to count on the experience of captain Adam Spray, Muhunthan Paramesvaran, Colin Gregory and Daniel Merriman to try and circumvent the loss of goalkeeper Tim Davies to the LPC in Egypt. The presence of friend of the firm, Ned, who deputised to brilliant effect between the sticks, also helped. First up for the boys was the very organised New London Lionesses FC. Straight into the Lioness’ Den if you will. The half time score was 0-0. It was a tight affair with few chances and the Lionesses arguably edged it. MP found himself in the wars, floored twice by the opposition’s coach – the team’s sole male player and a ‘big unit’ as they say in the trade. Gregory came on and transformed the game. His first touch after a lengthy layoff with a dodgy groin was to set himself up for a delightful finish to break the deadlock. It was a race against time for the team’s top scorer to be fit for the tournament. Perhaps the fortune he had spent on a physiotherapist to teach him bountiful muscle lunges had paid off. Others say it was the threat to put him in goal that saw him recover. MP then doubled the lead and Wilsons sought to see out the game in comfortable fashion. However, whilst the Lionesses bore down on goal, Spray ordered himself on and in the midst of the confusion, Wilsons conceded. It was an uncharacteristic and undisciplined act from Spray in an otherwise faultless captaincy in the build up to the tournament and throughout the competition. Thanks to Adam, the tactics, morale and the team biography were all on point. It was a nervy finish but Wilsons held strong. Points were on the board although tougher tests were expected to lie ahead. Perhaps this wasn’t the case. In the next game, Wilsons achieved their squad goals, and well, smashed Squad Goals 9-0. The goals kept coming and the never say die attitude of the side was epitomised by Tsigkas who pounced on the opposition’s error from their own kick off to open the scoring and also notably win a corner against all odds. Colin continued to bang in the goals and Sandiford patrolled the side from the back, providing the side’s beating heart. He too helped himself to a goal after a marauding run. Next was the big one – and the WAGs of Wilsons plus Larry Lock made sure they were on the sidelines in time for kick off to cheer on the team. 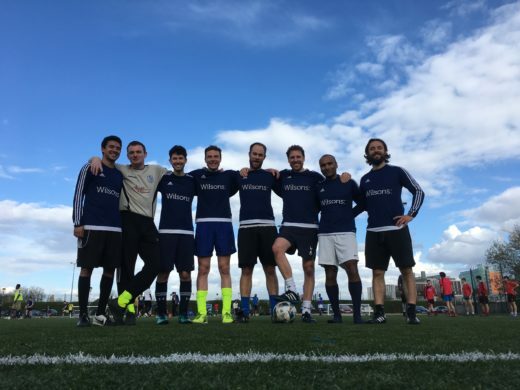 Things were looking good for Wilsons after their two wins but this would count for nothing were Duncan Lewis able to reap revenge for their 3-2 reverse at last year’s tournament. Not to be deterred by the fact the game was to be refereed by a Duncan Lewis affiliate (outrage #1) who insisted that they cover their stylish Wilsons: emblazoned kits with bibs (outrage #2) kindly donated by Garden Court FC, Wilsons: again started brightly, putting their foes on the back foot and peppering their goal for fun. The trickery and pace of Joshi tore Duncan Lewis apart and before long Tsigkas had put the favourites in front. It was certainly a day to remember for the side’s debutants. Duncan Lewis heads went down immediately and Wilsons: took advantage of this, going in 3-0 at the break after Merriman polished off a lovely Wilsons: move with a near post effort. The second half continued in the same manner as Duncan Lewis lacked fight and an expected reaction never came. Everyone wanted to get in on the act and it was MP who rounded off the 5-0 win with visible glee, applauding the side after another sweeping and devastating passage of play. As the players managed to put aside their differences with handshakes after the final whistle, the Duncan Lewis captain was overheard to confirm that their Twitter account would stay silent on this result. Wilsons thus entered the semi final stages with maximum points and only one goal conceded. The side had a considerable amount of time to prepare for a battle against Team Somaliland, who also topped their respective group. Whilst news filtered through from Turf Moor about Tottenham players dropping like flies, Wilsons muscles also started to seize up, and cancellations for Monday’s weekly training session came thick and fast. Recent San Francisco half-marathon champion and Wilsons:FC squad player, Rachel Wood, would not have been impressed. Ravaged by injury, the still lunging Gregory would start the knockout tie on the bench, whilst Team Somaliland somehow managed to call in a ringer from Duncan Lewis (outrage #3) to strengthen their own options. With overall time running short, half times were scrapped in a further blow to the aching legs. Nevertheless, as the sides chased a place in the final, the adrenaline of the high stakes tie soon took hold. As is typical of a semi final, the game was niggly and hard fought, with risk taking at a premium. Wilsons shaded possession but couldn’t break down a stubborn side until Merriman picked out the corner of the goal and shot straight through the hole in the net. 1-0. Could Wilsons avoid penalties and go one step further than last year’s efforts? No. Not long before the end, Team Somaliland’s guest player raced on to a long ball and slotted home to equalise. Desperate to avoid the lottery of penalties, Wilsons surged forward in search of what would have been a winning goal and rattled the cross bar with a late effort. As the ball bounced down it looked like it may have crossed the line but Waging Peace had understandably not invested in goal line technology and so any appeals would have been fruitless. Penalties it was. A big crowd amassed to see Team Somaliland put all their penalties away and Wilsons miss theirs. Sandiford and Spray coolly dispatched their penalties whilst Merriman needed three bites of the cherry to score his as he twice neglected to wait for the referee’s whistle. Wilsons could do with becoming au fait with the art of penalties in order to progress as a side. All in all, Wilsons:FC could be pleased with their efforts and it was no surprise to see Team Somaliland approach the team to ask for a couple of their star players to represent them in the final, which they went on to win. Certificates and trophies followed, along with eloquent and poignant speeches from the representatives of all those involved. We thank the tournament’s organisers Waging Peace and all the other teams who participated in a great day’s football and charity event; Team Rwanda UK, Team Sudan UK/WP, Club Soccer My Saviour, Geremi, Myself and I and Freed Voices.